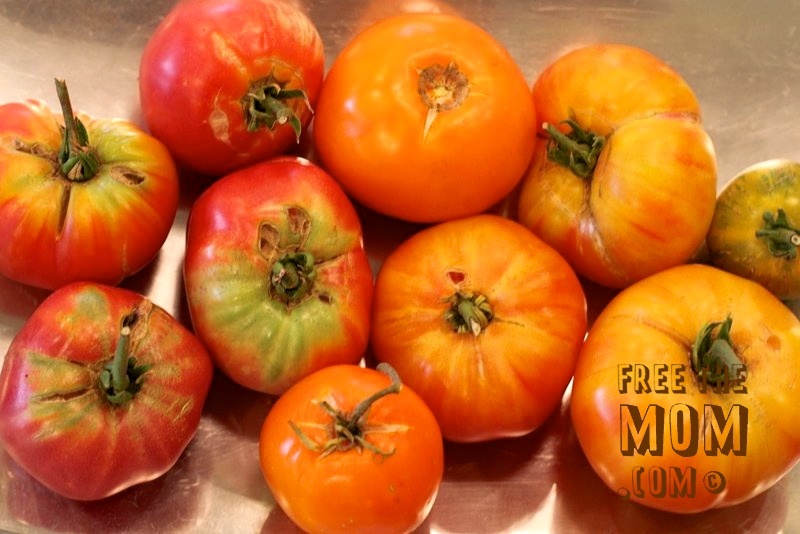 My dad and stepmom brought over some beautiful heirloom tomatoes form their garden yesterday, and I was left with the oh-so-glorious problem of what do to with them. 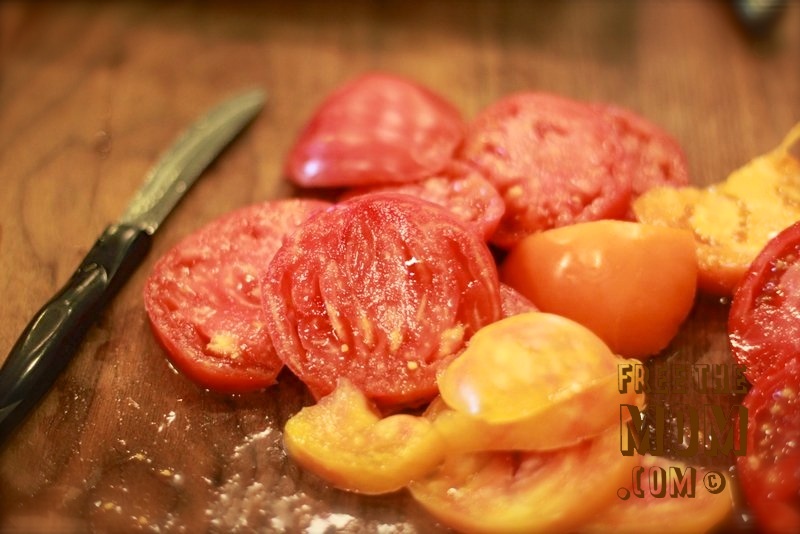 I turned to a recipe that I found a few years ago when my mother-in-law ended up with hundreds of ripe tomatoes. At that time I tried canning, making sauces, roasting, you name it. 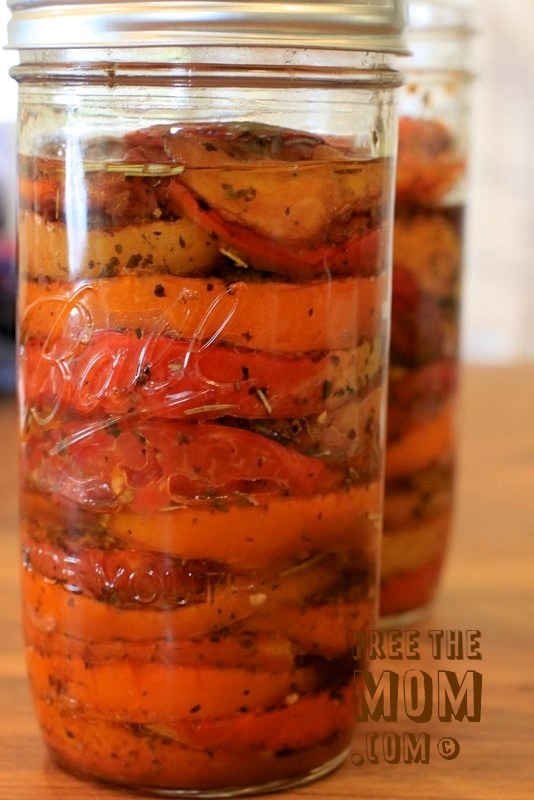 This recipe was my favorite, since these little beauties keep in olive oil for up to 2 weeks in the fridge and are super yummy on salads, sandwiches, pizzas, bruschetta…my fingers. This recipe is also completely easy. Kind of to the point that it’s not really even a recipe. Make it once and you’ll see what I mean. Start with about 6 beauties. 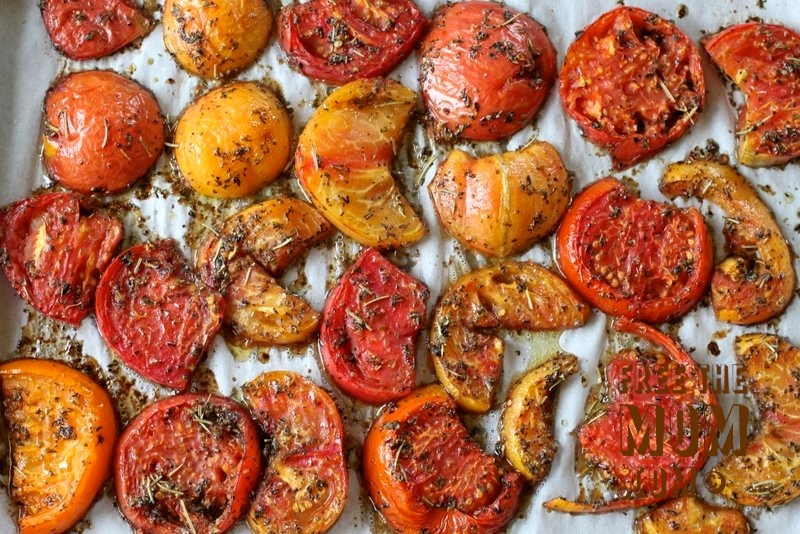 The recipe calls for roma, but these are heirlooms and I’m sure you could even use cherry tomatoes if that’s what you’ve got on hand. Cut into 1/4″ slices. The first time I made this recipe I cut the slices way too thin and they roasted down to mushy slivers. They still tasted delicious, but I’d recommend erring on the thicker side. They look prettier in the jar this way too. Now stir together the 2T olive oil (save the other 2c for later! ), balsamic vinegar, lemon juice, dried herbs, salt and pepper. Mix in the tomatoes until you start salivating. Mmmmmmm. 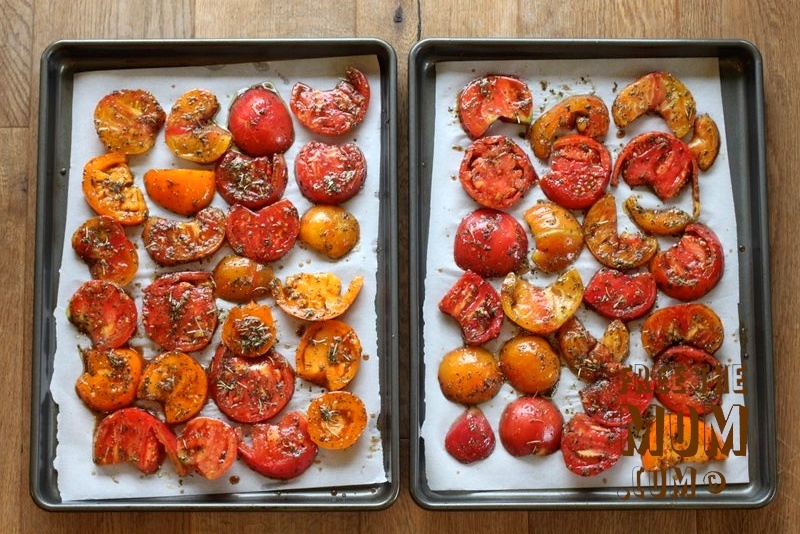 Lay out your yummy coated tomato slices onto a baking sheet covered with parchment paper (don’t skip it or the tomatoes will stick and that’s no fun). As you can see I made a double batch today because the bounty was overflowing. Pop these babies into a 250 degree oven for an hour. About halfway through your kitchen will smell like an Italian restaurant and you will feel the urge to write me a thank-you note. And maybe send flowers. This is the beauty that will greet you when you open the oven. You should probably eat one right away, then wait about 15 minutes for the rest to cool completely. 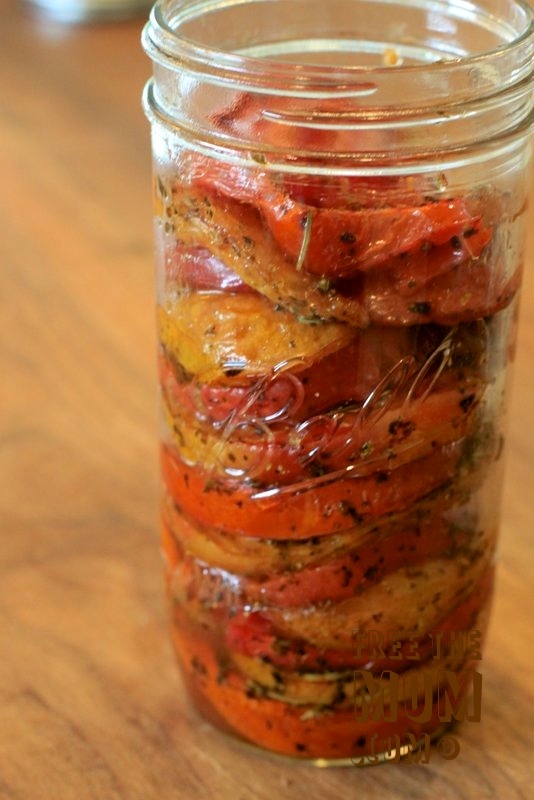 Once cool, layer your tomatoes into a mason jar (I use widemouth for this, I think a pint and a half?). Step back and feel very proud of this project that only looks like a lot of hard work. My favorite kind. 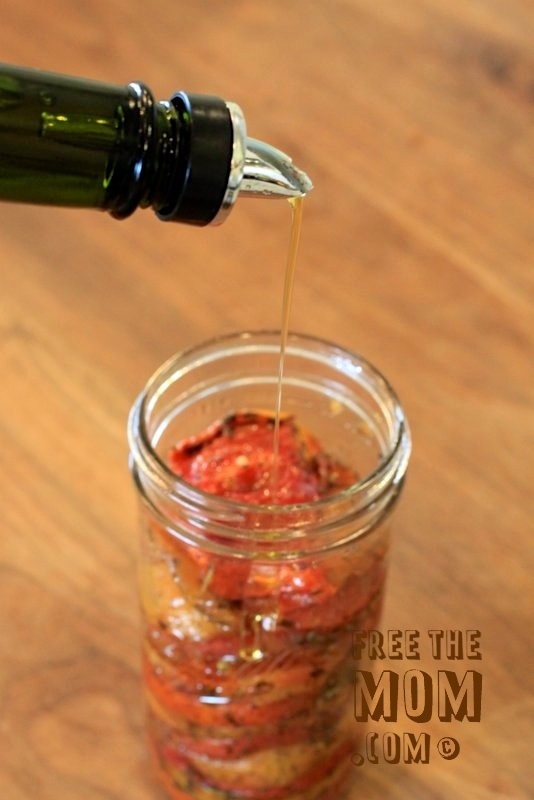 The last super difficult step is to lift your bottle of olive oil, tilt your hand so that it is parallel to the countertop, and pour the olive oil to the top of the jar. Whew! You’ve just created a delicious treat that will keep in the fridge for up to 2 weeks. 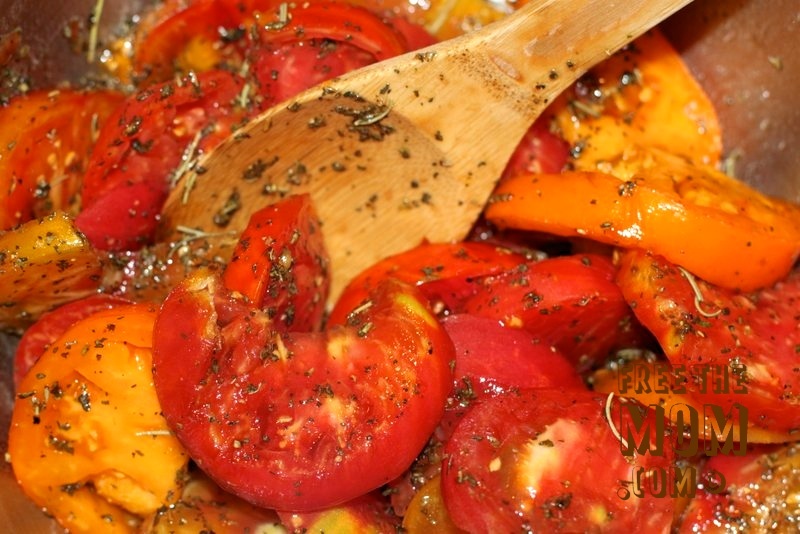 When you take the tomatoes out of the fridge you will find that the oil has solidified a bit. Don’t worry – just let it sit at room temp for a few minutes and it’s as good as new. And whatever you do for God’s sake don’t throw away the olive oil after your tomatoes are all gobbled up! Use it in dressings, sauces, marinades, or anything that needs a little herbaceous pick me up. I’m telling you, this recipe is so good it could totally make you some new friends. Which is why I always make a double batch – one jar to keep, and one to give away. Try it, friends, and invite me over for a taste test while you’re at it! ← Chicks and puppies. So cute I’m pooping rainbows. Thank you, thank you, thank you! I can’t wait to try this!! Do try! Then tell me how it turns out 🙂 This batch was so yummy that I had to make another yesterday! I shall try it & have you over for testing …. Beautiful, Anjalé. You’re definitely carrying on the Armand/Ittu tradition of culinary excellence. Try it and report back, stat!